March 19, 2018 By Elise 2 Comments This post may contain affiliate links. Please read my disclosure policy for more info. Looking for the perfect breakfast treat? 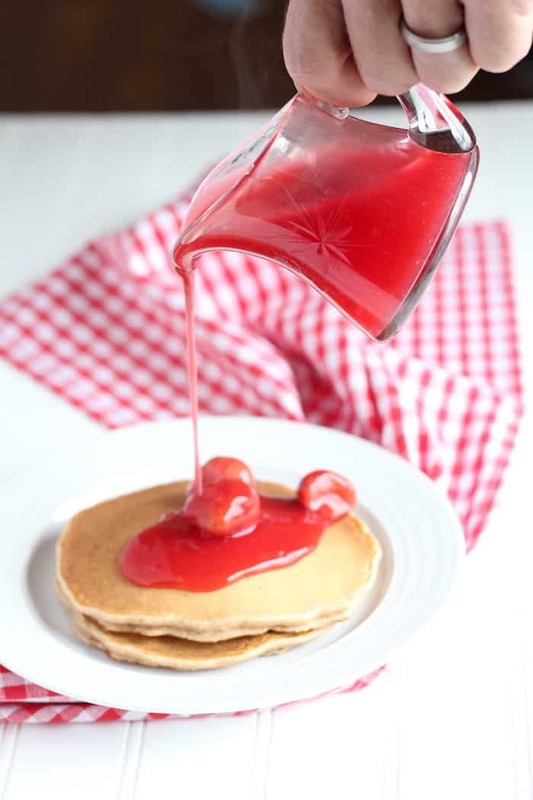 This strawberry syrup recipe will be the perfect fruity topping for your waffles or pancakes. One year when I was a teenager, I got the crazy idea to plant 200 hundred strawberry plants. I know, not your usual teenaged antics, but we lived on a small farm right in the middle of a small amish community, so it was really pretty normal behavior for the second oldest of 8 kids believe it or not. That year, I diligently picked every blossom off my little plants, did an ungodly amount of weeding, and the next spring, I was rewarded with gallons and gallons of strawberries to pick and, since we didn’t have a freezer, can. Little did I know, that was the start of a “thing” in our family. We didn’t really know what to do with canned strawberries, so those dozens of jars just sat on the shelf for a very long time until one day, mom got the idea to develop a strawberry syrup recipe with them. It turned out to be the best idea ever. I don’t think I ever heard of putting anything but maple syrup on pancakes before that, which, looking back, is a little funny. To this day, whenever I see strawberry syrup, I think back to those strawberry plants, my mom’s creativity, and how much my dad still loves strawberry syrup on pancakes and waffles. One of my favorite post-run indulgences today is gluten-free Belgian waffles, and homemade strawberry syrup. The perfect balance of tangy-sweet, and yeasty. So good! 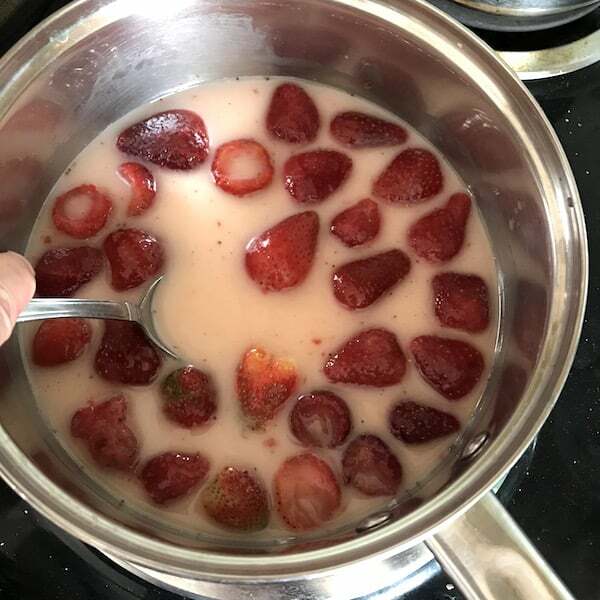 Today, I usually freeze strawberries because it’s obviously much more versatile not to mention easier, and we use a lot of them in healthy smoothie recipes. 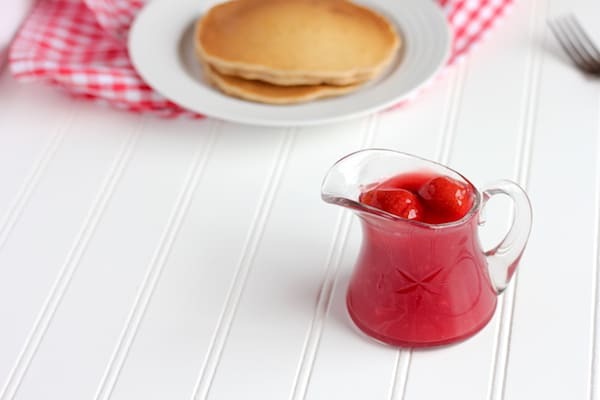 But making this strawberry syrup recipe works just as well with fresh or frozen berries as it does with canned strawberries. P.S. If you’re interested in pressure canning, check out this cool tutorial: How To Use A Pressure Canner. Cook over medium heat, stirring, until syrup thickens and turns clear. Hi Amina, Nice to meet you!